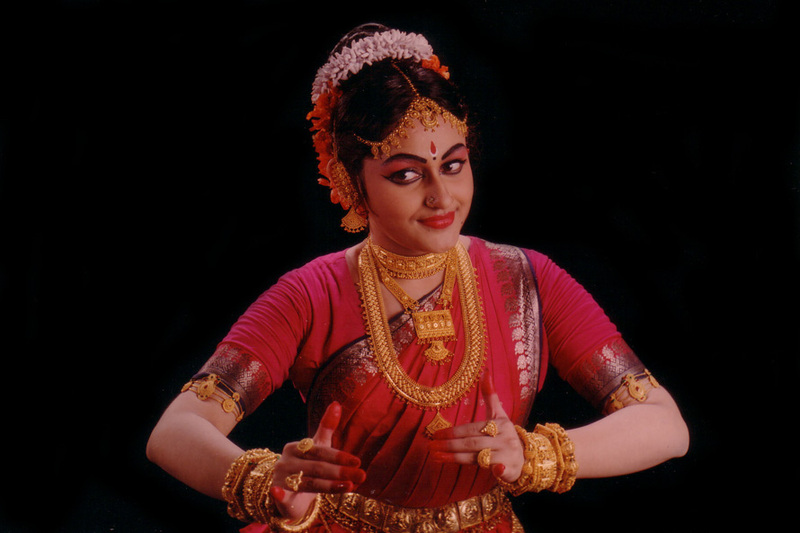 Sanjukta Banerjee is an Indian Classical dancer and educator specializing in Bharatanatyam and Mohiniyattam. An empanelled dancer with Indian Television, Eastern Zonal Cultural Centre and Sangeet Natak Academy, she has extensively toured all over India, Middle-East, South-eastern countries of Asia, Europe, USA and North America. Sanjukta has performed in various major Dance and Theatre Festivals all over India. Sanjukta has gained wide acclaims for her performances of "Durga" for Doordarshan on the occasion of MAHALAYA for National Network Indian Television since1994 to 2014 and also in the role of Draupadi in Mahabharata dance drama for NABC' 2013. Artistic Director of Saugandhikam Dance Academy, she conducts classes in Toronto and Mississauga, also offers Skype/online lessons of dance. She is currently pursuing Doctoral studies at Dance department of York University, Toronto with research interests in gendered bodies and reenactment of movements in traditional repertoires. • Master of Arts, Dance, York University, 2015. • Master of Arts, English Literature, Calcutta University. • Kathakali – Late Guru Kalamandalam.P. Govindan Kutty. • Artistic Director of Saugandhikam Dance Academy, Kolkata, Toronto. • External Examiner for Undergraduate & Graduate Degree programs in Rabindra Bharati University, Kolkata. • Judge for State & National level Dance competitions. • Offered courses/Lecture-demonstrations/workshops in Universities on Bharatanatyam, India, Lebanon, Canada & US. • Sanjukta has received scholarship in her Master’s program of Dance at York University. • Senior Research Scholarship, by Dept. of Culture, Govt. of India in MOHINIYATTAM. • ‘Natya Kala Rathna’ Title by Regatta Kala Kendra and NKK, Toronto, 2015. • "Outstanding Young Person '97” by North Calcutta Junior Chamber, Kolkata,1997. • "CCI" award '97 by Critic Circle of India, New Delhi,1997. • "Singar Mani" title awarded by Sur Singar Samsad, Mumbai, 1999. • Jadubhatta Purashkar '95 by Salt Lake Music Conference, Kolkata, India,1995. • 37th Dover Lane Music Conference. Kolkata, 1989. • Diamond Jubilee Celebrations of Kerala Kalamandalam, Trichur 1990, Calcutta, 1991. • Youth Festival, Calcutta 1990. • 3 - City Dance Festival (Org. : ITC) in Vishakhapatnam, Patna, Lucknow in 1991. • International Festival of Performing Arts, Beirut, Lebanon, 1994. • Salt Lake City Music Conference, in Calcutta 1994 and 1995. • Vasanta Utsav (Org. : EZCC) Burdwan, W.B. - 1997 and 1998. • Kal Ka Kalakar (Org. : Sur Singar Samsad), Mumbai 1998. • Haridas Sangeet Sammelan, Mumbai 1999. • Bhakti Kala Kshetra (Org. : ISKCON), Mumbai 1999. • India International Centre, New Delhi 1999. • Udayshankar Dance Festival, Kolkata,1996,1998,2000, 2001,2014. • Konark Festival, Orissa 2000. • Indian Classical festival, Kuwait, Qatar, Doha, 2000. • Swarna Nritya Pratibha, Sangeet Natak Academy, Delhi, 2004. • Darjeeling Carnival org. by ICCR, EZCC, Russian Consulate, 2005. • All India Women’s' Conference, EZCC, Kolkata, 2006. • National Centre for Performing Arts, Mumbai '2006. • Rabindra Jayanthi Celebrations, Singapore, 2006. • Epar Bangla-Opar Bangla,WMBA, Michigan, 2008. • World language Day, University of Lansing, 2010. • Indian festival, Saugatuck Performing Arts, Michigan, 2011. • 33rd North America Bengali Conference, Toronto 2013. • Dundas Square, Indian Consulate, Toronto 2013. • Toronto Islington-Albion Festival, 2013. • Follow- Me TV launching Ceremony, Toronto 2014. • Inspirations 2013, sponsored by Toronto Arts Council, 2013. • An empanelled dancer of Cultural Dept. Govt. of India. • She has gained wide acclaims for her un-daunting performances as "Durga" for National Network Indian Television from 1994 -2004, which is a record by itself. • She has been cast in the role of "Durga" for special transmission on the occasion of Mahalaya on the birth centenary of Dr. Birendra Krishna Bhadra for National Network transmission in 2004. • Participated in film director Gautam Halder's award winning documentary on the great tabla maestro Hiru Ganguly, 1994. • Participated in documentary "Searching for Happiness" produced by German television on India in 2004. • ICONDE 2014, University of Malaya, Kuala Lumpur. • Dance Transition Resource Centre 2016, “On the Move”, Sony Centre for the Performing Arts, Toronto. • 15th Art History Symposium 2016, York University, Toronto. • International Federation for Theatre Research 2016, Presenting the Theatrical Past, Stockholm, Sweden. In Canada she is an active member of the SAMAHAR DANCE ENSEMBLE which focus on Unity in Diversity and promotes choreography based on ensemble of different Classical dance styles. 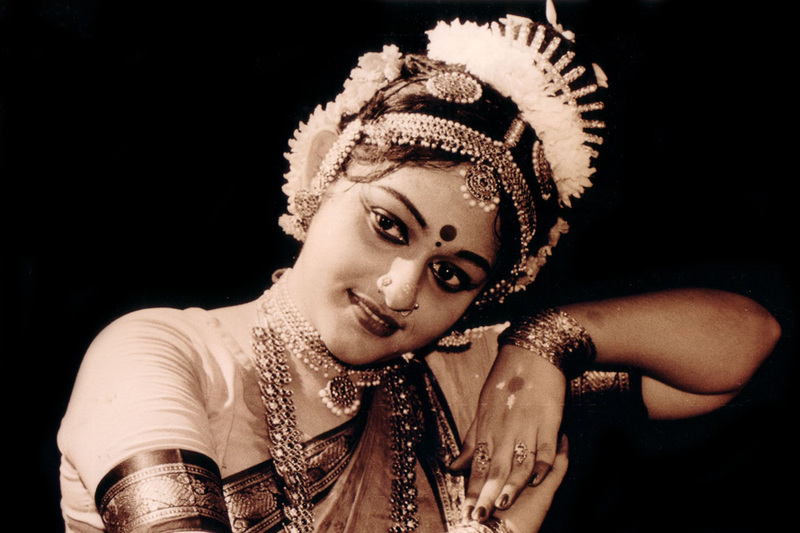 - Has to her credit various compositions of Bharatanatyam & Mohiniyattam numbers. - She has worked in the leading character roles of various dance dramas by Rabindranath Tagore. - Has to her credit choreographed thematic concepts on mythological & contemporary themes. - Working extensively with younger generation for spreading Indian culture & heritage through classical dances , from her Academy "Saugandhikam" Kolkata, India. She is an examiner of the graduate and post-graduate degree courses of Rabindra Bharati University, Kolkata. Bharatanatyam, as Balasaraswati puts it, is an artistic yoga (natya yoga), for revealing the spiritual through the corporeal. It is the most widely practised of Indian classical dances. It is the most ancient of all the classical dance forms in India, which are based on Natya Shastra, the Bible of the classical Indian dance. 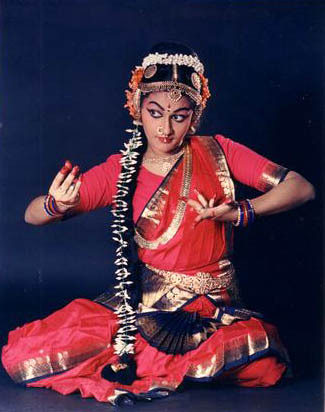 The term "Bharatanatyam" was used by Purandara Dasa (1484-1564). Gods and Godesses pleaded with Lord Brahma for another Veda to be created that would be simple for the common man to understand, which is particularly important in Kali Yuga. Granting their wish, Lord Brahma created the Panchamaveda, the Fifth Veda, or NatyaVeda, a quintessence of the main four Vedas. Brahma took pathya (words) form the Rigveda, abhinaya (communicative elements of the body movements, cf. mime) from the Yajurveda, geeth (music and chant) from Samaveda, and rasa (vital sentiment and emotional element) from Atharvaveda to form the fifth Veda, NatyaVeda. After creating this Veda, Lord Brahma handed it to sage Bharata and asked him to propagate it on earth. Obeying the fiat of Lord Brahma, sage Bharata wrote down Natyashastra. Bharata together with groups of the Gandharavas and Apsaras performed natya, nrtta and nrtya before Siva. It became the most authoritative text on the artistic technique of classical Indian dances. It is also possible that the term "Bharatanatyam" partly owes its name to sage Bharata. The Natya Shastra reads, "When the world had become steeped in greed and desire, in jealousy and anger, in pleasure and pain, the Supreme One (Brahma) was asked by the people to create an entertainment which could be seen and heard by all, for the scriptures were not enjoyed by the masses, being too learned and ambiguous." "This art is not merely for your pleasure, but exhibits cosmic expression (bhava) for all the worlds. This art has been created following the movements of the world in work and play, profit, peace, laughter, battle and slaughter, yielding the fruit of righteousness to those who follow the moral law, a restraint for the unruly, and a discipline for the followers of the rule; to create wisdom in the ignorant, learning in scholars, and endurance to the sorrow-stricken; it is replete with the diverse moods, informed with varying passions of the soul, and linked to the deeds of mankind — the best, the middling and the low..."
Another version of the origin of Bharatanatyam is that Goddess Parvathi taught this dance art to Usha, daughter of demon Banasura. Usha handed it down to the Gopikas of the city of Dwaraka, Lord Krishna's birth place. Lord Shiva is himself the Supreme Dancer, and the whole Universe is His Divine Dance. Goddess Parvathi dances with Him. 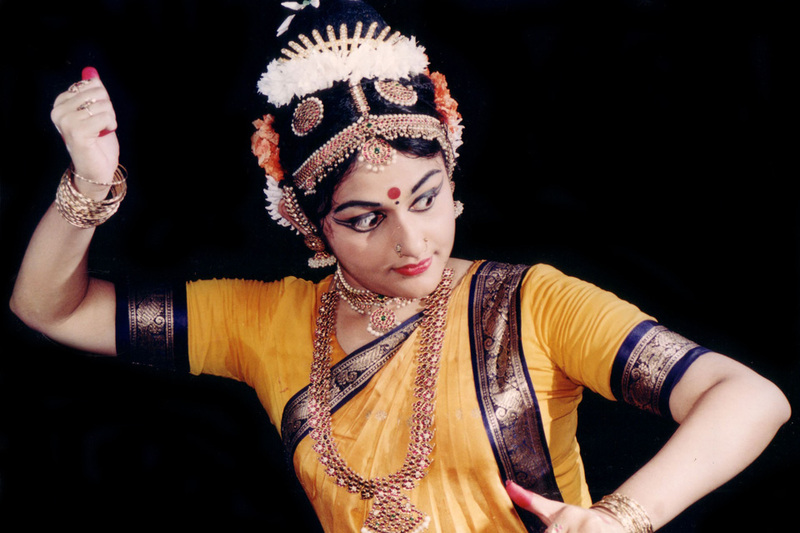 Bharatanatyam has been undergoing a lot of change over the centuries. Centuries ago the Hindu temples in South India had dancers-priestesses called devadasis who would sing, dance Dasi Attam (old version of Bharatanatyam). They were well-versed in Sanskrit and other languages as they had to adapt compositions to suit the audience. The devadasi tradition gradually degraded. As the dance entered the royal courts, the dancers were called Rajanartakis, who performed in the royal courts . In the first half of the 19th century much of Bharatanatyam was redefined by the contributions of four talented brothers known today as the Tanjore Quartet: Chinniah, Sivanandam, Ponniah and Vadivelu. This infusion of creative energy marks the early 19th century as one of the most innovative periods in the history of Bharatanatyam. Bharatanatyam has undergone much change but is still deeply rooted in the spiritual Hindu heritage. 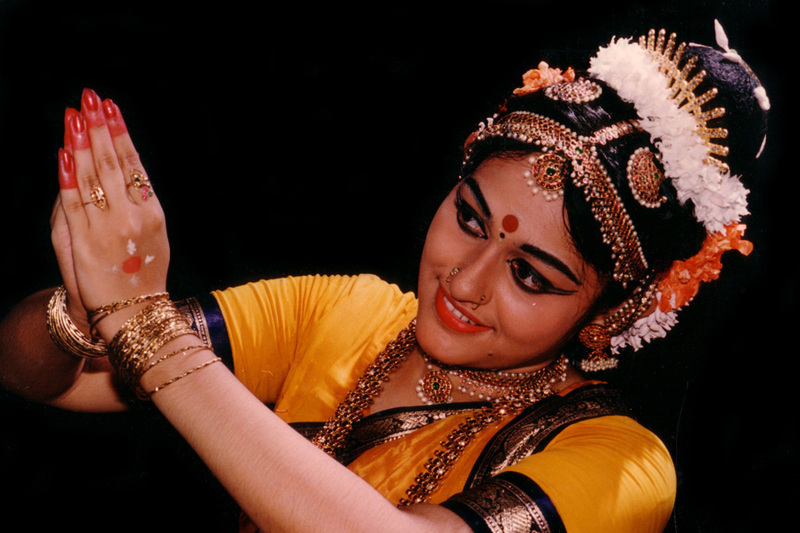 Bharatanatyam, is the embodiment of music in its visual form. Sringara stands supreme in this range of emotions. No other emotion is capable of better reflecting the mystic union of the human with the divine. Sringara thus is an instrument for uniting the dancer with Divinity. 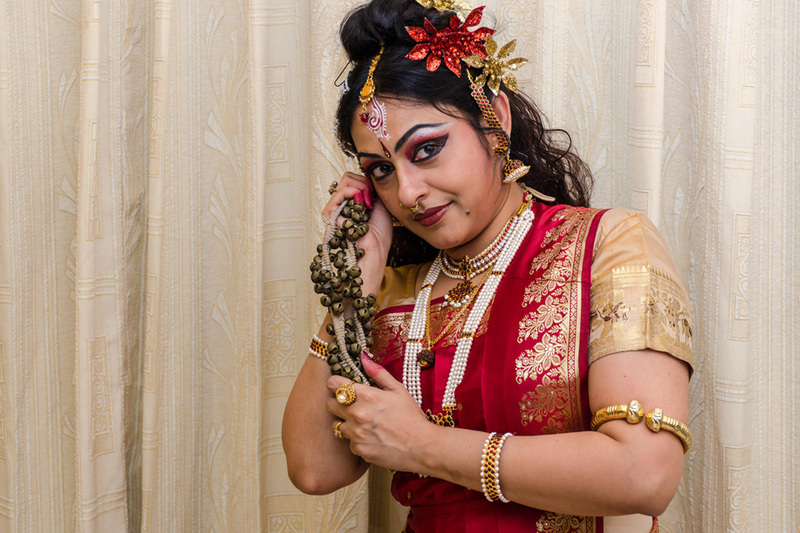 Since the dancer has universalized her experience, all that she goes through is also felt and experienced by the spectator.Bharatanatyam is an attempt to embody the divine beauty, charm, rhythms and symbols that exist in heaven. Bharatanatyam is a means of spiritual elevation both for the dancer and the audience. (Sringara) forming the quintessence of this dance form. Of all the classical South Indian styles, Mohiniyattam can be singled out with admirable distinction, for it's characteristic body movements, marked by the graceful sway of the torso. What is unique is the easy going rise and fall of the body, with emphasis mainly on the torso. The movements are never abrupt, but dignified, easy, natural, restrained and yet subtle. The glances, postures, gait employed are so subtle and graceful that they convey the infinite suggestiveness of radiant love. The traditional costume worn in Mohiniyattam is white with a gold border, and gold ornaments are worn. The unique coiffure with hair gathered on the left side of the head reflect it's aesthetic appeal, making it distinct from the other dance forms of India. The regional system of music that Mohiniyattam follows is the SOPANA style which in it's lyricism is evocative of the spiritual element. It was during the reign of the great Poet King, Maharaja Swati Tirunal that Mohiniyattam received considerable patronage. After his untimely demise, adverse circumstances led to the decline of this dance form till when in the 1930's Mahakavi Vallathol founded the Kerala Kalamandalam and once again revived the dance form.Poet Vallathol revived this art form, which once witnessed a great downfall. He gave it a status in modern times through Kerala Kalamandalam, which he founded in 1930. 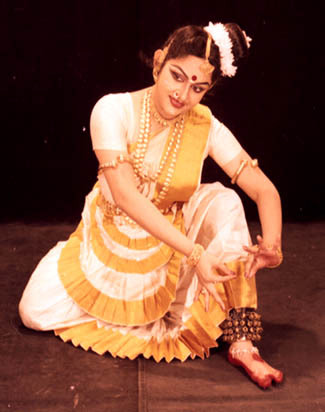 Kalamandalam Kalyaniamma, the first dance teacher of Kalamandalam was instrumental in resuscitating this ancient art form. Along with her, Krishna Pannicker, Madhavi Amma and Chinnammu Amma whose disciple is Guru SMT . Thankamani Kutty, the last links of a disappearing tradition, nurtured aspirants in the discipline at Kalamandalam. The dancer attempts to popularise the form by implementing the style to create ballets on various themes and languages, so that the style gains popularity among all, irrespective of any distinction.